I registered a new domain (ssml.io) and I want to use it to host a static website using S3 and Cloudfront. 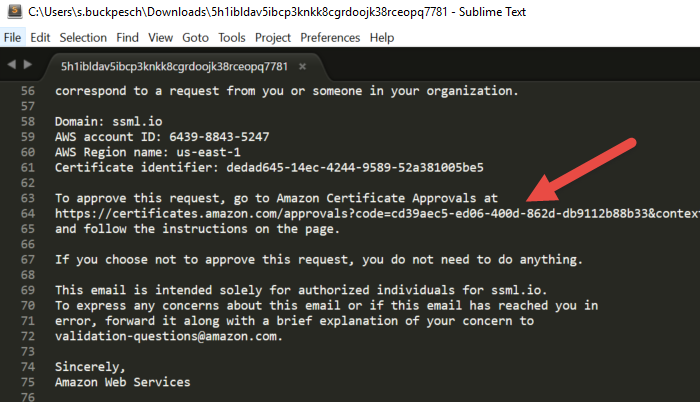 For this website I want an SSL connection using a AWS Certificate Manager certificate. I assume that you already have a (new) domain registered in Route 53 with no A or MX records setup. 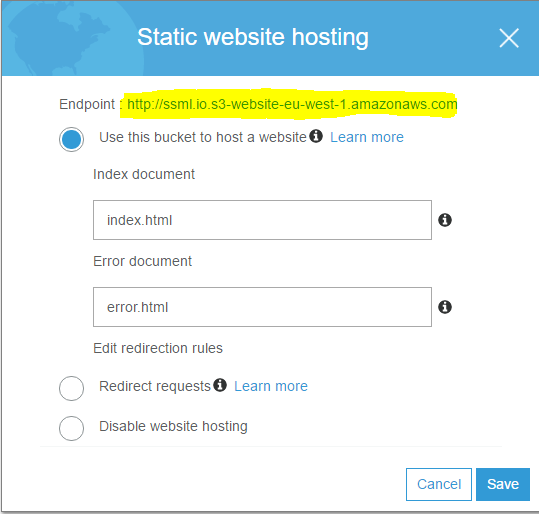 Open the buckets properties and activate “Static website hosting”. Make note of the Endpoint URI. To save emails on your bucket from SES later, you need to grant permissions to SES to write to your bucket. Add the following bucket policy and replace YOUR_BUCKET_NAME and YOUR_ACCOUNT_ID with your corresponding values. 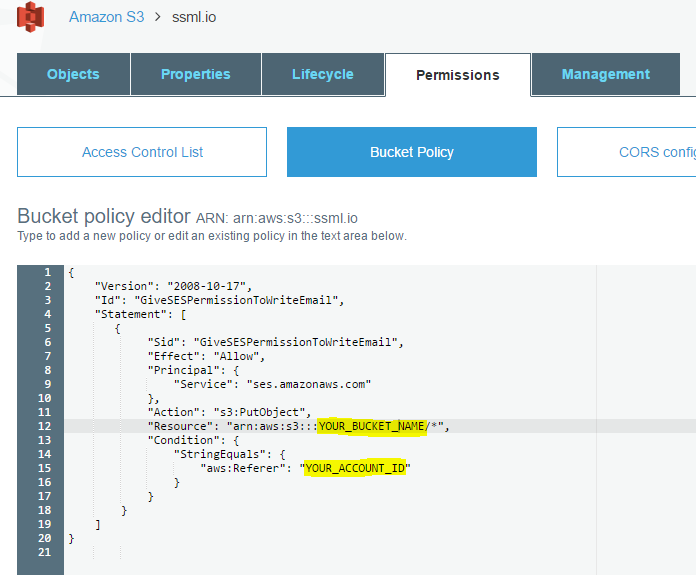 Save the policy, upload your index.html file and your are done. SSL certificates can only be assigned to cloudfront distributions, so we need to create one to enable SSL for our static website. 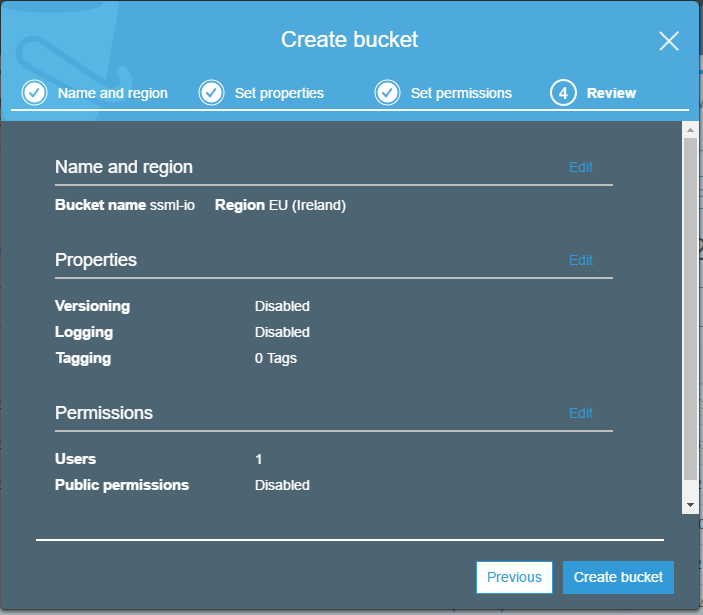 Create a new Web distribution and select your S3 bucket as Origin Domain Name. 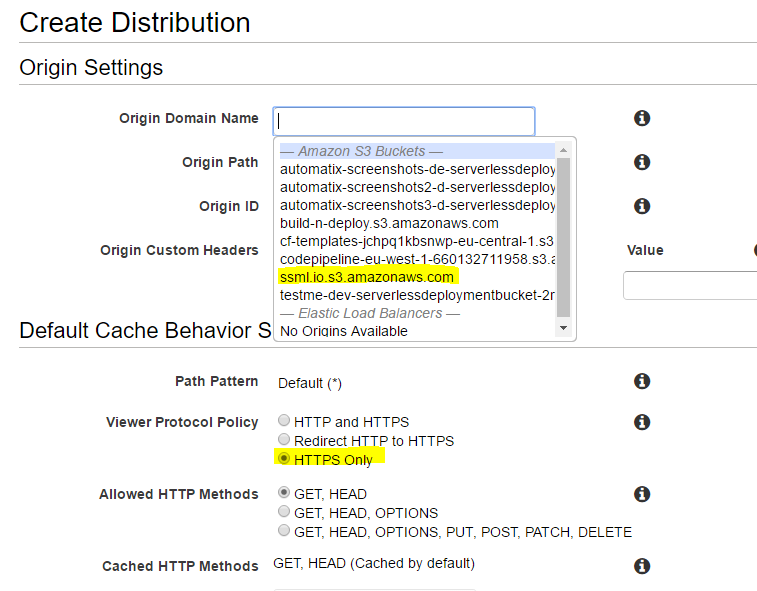 Select HTTPS Only for Viewer Protocol Policy. In the Distribution Settings section enter your domain name you want to host your static files on (My site is https://ssml.io). Do not change the SSL Certificate settings for now, as we did not setup our email address to receive the domain validation email for our certificate request. Go to AWS SES and verify a new domain. Generate DKIM Settings as well. In the left navigation head to “Rule sets”, create a new one and a new “Rule”. Enter administrator@yourdomain.com to the receipients as this email address is used by default to receive SSL certificate domain verification emails. In the bottom part of the rule settings define a S3 Rule to save incoming email to a ‘folder’ in your bucket. 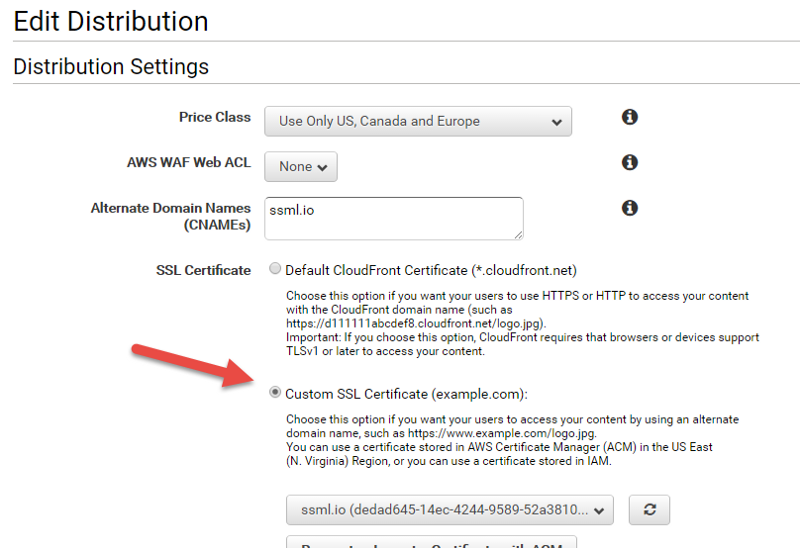 Cloudfront only accepts certificates hosted in region us-east-1. Switch to that region NOW. Enter one or more domain names, you want to create a SSL certificate for. You can even use a wildcard. Now you should have a new email on your S3 bucket containing the verification link. Download the email file open it in your favorite text editor and copy the verification link to your browser. You’re almost done. Go back to Cloudfront and edit your distribution. Now you should be able to select your brand new SSL certificate.